The Denti Brush Interdental Sticks & Travel Case effectively cleans plaque and food debris from interdental spaces, and eliminates potential damage to teeth and gums, and is perfect for use around implants and metal fillings. The interdental sticks effectively massage and strengthen gums to increase blood circulation, helping to make them resistant to disease. These wire free interdental brushes are very soft and comfortable to use. 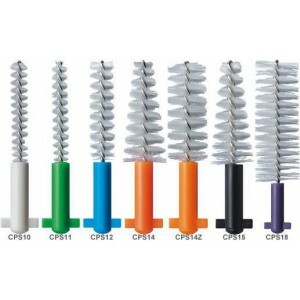 The small flexible rubber like brushes adapt to interdental spaces. Brush size is 3.0mm tapering to 1.0mm. Warning: Excessive flexing of the tip may cause the end to break off.